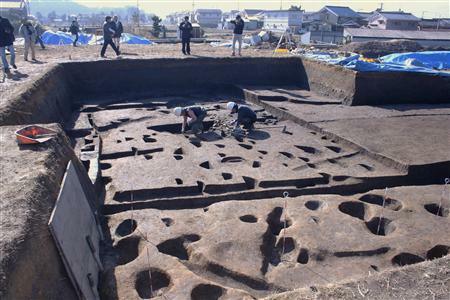 Following the 2009 and 2011 finds of several large buildings, it was announced on February 1 that over 100 postholes dating to the early 3rd century were found at the Makimuku site (纒向遺跡) in Sakurai city, Nara Prefecture. Clustered within an approximately 60-square-meter area to the west of the building complex, they appear to represent the repeated reconstruction of a small-scale building. An excavation in 2009 revealed evidence of four buildings dating to the early 3rd century aligned along an east-west axis at the center of the Makimuku site (see post linked to above for previous discussion). One of the buildings measures 238 square meters, the largest building discovered thus far for its time, and is posited as the palace of Queen Himiko, the shaman queen mentioned in the Chinese History of the Three Kingdoms(Sanguozhi). This most recent find, however, suggests that the building located furthest west was no building at all. The postholes of the building did not pan out. 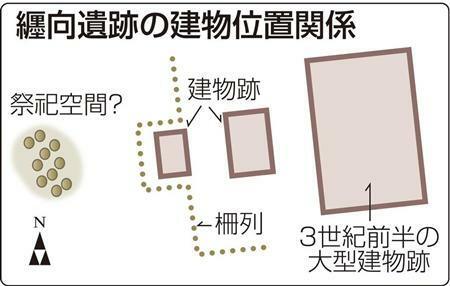 It would appear that the building complex contained three buildings, in addition to the posthole cluster. Many researchers consider Makimuku to be the location of Yamatai, the 3rd-century capital of the kingdom of Wa. An additional excavation in 2011 revealed evidence of another building 5 meters to the east of the supposed site of Himiko’s palace. 3 rectangular post holes, believed to have supported thick pillars, each measuring 1.2 meters across and 60 centimeters deep stretch for 9 meters; 2 square post holes, believed to have supported relatively smaller pillars (these tsukabashira [束柱] are believed to have supported the flooring) are located one each between the larger holes. Archaeologists suspect that this building may in fact be of the same size and construction of the building positioned as Himiko’s palace. The building found in 2011, however, dates to the late 3rd century/4th century, according to pottery found on site, separating it from the time of Himiko, who is recorded in the Chinese chronicle to have died around 248 AD. The numerous postholes vary in size, from 10 to 60 centimeters in diameter. They are believe to be located at the entrance to the building cluster. According to Tatsumi Kazuhiro, a former professor at Doshisha University, the building may have been the stage for rituals celebrating bountiful harvests, the signs of rebuilding suggesting that the building was torn down and reconstructed each time. Additionally, a section of a moat was found dating to the middle of the 4th century. The section stretches approximately 45 meters east-to-west and 7.5 meters north-to-south. At its maximum, it is 5.8 meters wide and over 60 centimeters deep. Judging from past excavations, it is believed to stretch around 57 meters east-to-west. The moat is believed to have surrounded this central area. While no contemporary buildings have been found yet within its borders, a wooden ritual object in the shape of a sword measuring 31.5cm long was uncovered. This post will be updated as more information is released. While much of our understanding is fragmentary, it is at least clear that this area was home to continued occupation and ritual use for around 150 years and overlapped with both Himiko’s rule and the beginning of monumental keyhole-tomb construction in the vicinity.